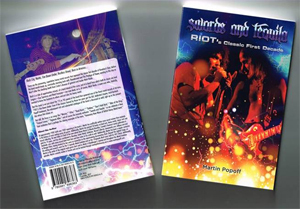 Heavy metal author and Bravewords senior writer Martin Popoff has released a new book on RIOT. titled Swords And Tequila: Riot’s Classic First Decade, it documents one of metal’s previously unsung and tragic tales. Rock City, Narita, Fire Down Under, Restless Breed, Born In America... These are the pioneering, superlative heavy metal records that represent the classic first decade of Brooklyn’s RIOT, before the band would break up, eventually storming back with Thundersteel and The Privilege Of Power, existing to this day as RIOT V after the shocking death from Crohn’s disease of guitarist and leader Mark Reale. But still, the focus is on songs like “Warrior”, “49er”, “Road Racin’”, “Outlaw”, “Don’t Hold Back”, “Altar Of The King”, “Violent Crimes”, “Vigilante Killer” and of course the insanely anthemic “Swords And Tequila” as we celebrate a New York institution that is perhaps the shining exemplar of the term, “honorary New Wave of British Heavy Metal” band. Email martinp@inforamp.net with any further questions, and see martinpopoff.com for descriptions, cover art and ordering info for his other available 30 or so books.